About Toshidama Gallery, Japanese Woodblock Prints, Fine Japanese Art. Toshidama Gallery sources Japanese woodblock prints from all over the world. We try to include a wide range of prices in each of our monthly shows so that this great art is open to everyone to own and collect. Each print we sell is carefully researched and checked so that the purchaser can be sure of its authenticity, of its value and where possible, its provenance. We try to give you as much information as we can: artist, subject, history, dates, back story and even the performance dates of kabuki plays and scenes. All of this is done to give clients the most comprehensive experience of this wonderful work. Prints are supplied to you mounted on museum quality archive board. We only use fully reversible archive tape to attach prints to their support. The mounted pieces are put into pH-neutral protective mylar sleeves before being shipped. We use DHL for most shipping. This service means that you receive your prints very quickly and the work is fully insured. We love this work and we want others to appreciate its beauty and quality. 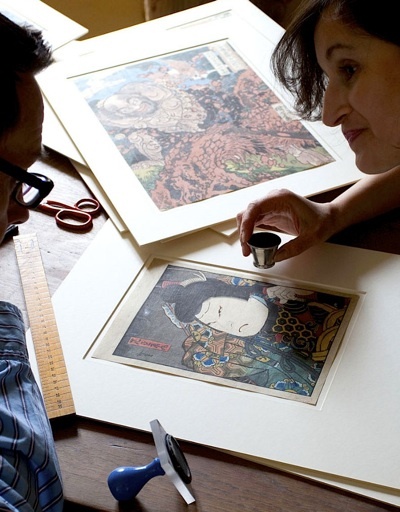 Ukiyo-e prints represent one of the few collectable and original antique arts available to most pockets. They always add dignity and style to interiors and are consistently sound investments even during the current economic crises. To find out more about Toshidama Gallery sign up to our monthly newsletter and receive exclusive discounts on each show.Alternately, you can stay in touch via our Blog, Twitter or Facebook pages. A Toshidama is a New Year's gift to children. These days these are usually gifts of money in printed envelopes but in the past they were small presents, wrapped in a twist of cloth and this image became the signature, or seal, of a school of artists called the Utagawa school. You will see this small round seal on the prints of Kunichika and of Kunisada among others.